Welcome to the first part of our discussion and introduction to the world of Magic: The Gathering. In these articles, we’ll be trying to explain the rules of the game in a logical and easy to follow fashion, explaining potential points of confusion along the way. What is Magic: The Gathering? Magic: the Gathering was one of the original Trading Card Games available in the West and has had enduring appeal. Players take on the role of Planeswalkers, drawing energy from the places across the multiverse which they have visited, summoning creatures and casting powerful spells to earn their victory. In game, this translates into players playing Land cards to generate ‘Mana’ which is then used to play other cards. 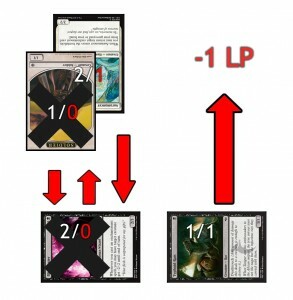 Players win when they achieve one of several win conditions, including reducing the opponent’s life to 0 or by removing all of the cards from their opponent’s deck (milling). Magic: The Gathering has several formats, but most notably a competitive scene based around its ‘block’ system, which limits the cards usable in decks to those released within the last year. This is an example Basic Land. All decks require land as it is what produces Mana, allowing other cards to be used. This card simply has a title (‘Island’) and a portrait. The water droplet in the bottom middle of the card depicts the type of Mana it produces (Blue), while the symbol at the middle-right shows the set it came from and the rarity. Any number of Basic Lands may be included in decks, with most decks being composed of about 33-40% Land (20 to 24 cards). There are five types of Basic Land, each of which produces a different type of Mana: Island (Blue), Swamp (Black), Plains (White), Forest (Green) and Mountain (Red). There are lands which are not Basic, but these are relatively rare. This is an example Creature card, Llanowar Elves. This card has a lot more detail on it, but is still relatively simple to read! At the top, we have the name (Llanowar Elves) and in the upper right corner is the Mana cost (one Green Mana, depicted by a single tree). The Green Mana symbol is on every Forest card, which serves as a reminder of how it is produced. We then have the portrait, and below that the text ‘Creature – Elf Druid’. ‘Creature’ shows the main type of card it is, while ‘Elf Druid’ describes its race. This information is often used on other cards – for example, there are several cards in the game which give bonuses for how many ‘Elves’ you control! The box below that gives the card’s effect ([Tap]: Add one Green Mana to your Mana pool) and the ‘flavour text’, which simply gives an idea of the story behind the card. In the bottom right, we can observe the cards Power (left) and Toughness (right), which are used in combat. Creatures are Permanents, and remain in play after they are summoned. Permanents usually occupy one of two positions – Tapped or Untapped. 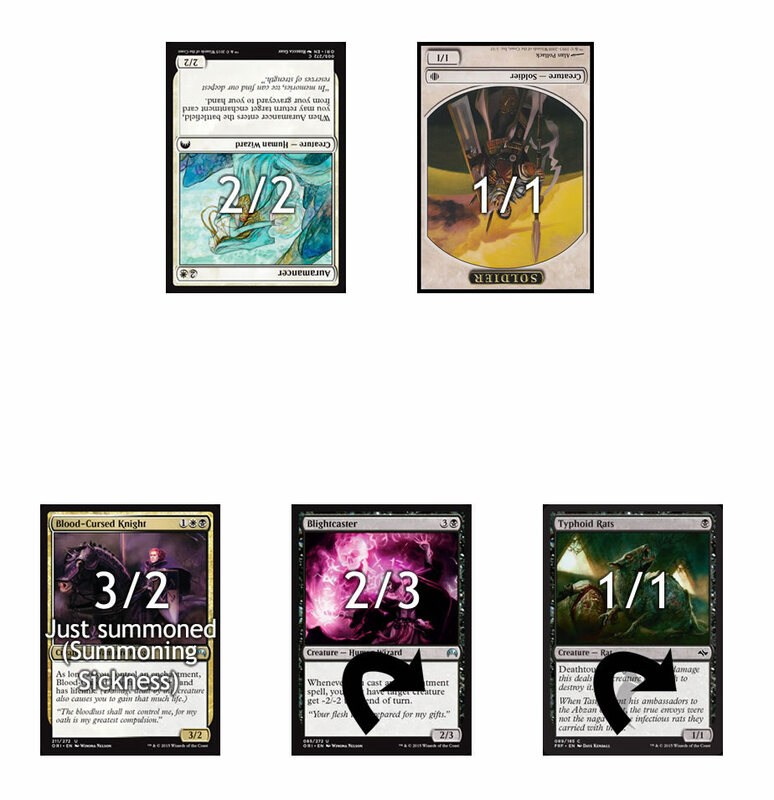 All Permanents, unless an effect states otherwise, enter play Untapped (upright) and become Tapped (sideways) when being used for Mana (lands), attacking (creatures) or using their effect (multiple types of cards). This allows players to easily keep track of which cards are free to attack or use their abilities! This is an example Sorcery Card, Counsel of the Soratami. On this card, the Mana cost is more complicated. There is a 2 in a circle, and a single Blue Mana. 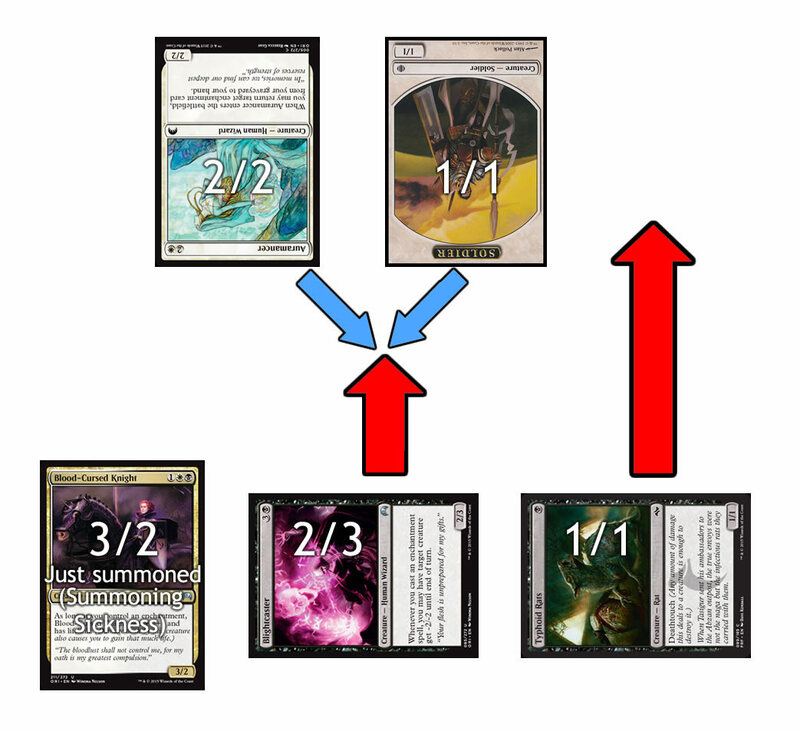 The (2) represents a cost of two Mana of any colour, while the Blue symbol is one Blue Mana. This means that the card has a total Mana cost of 3, of which at least one needs to be Blue. Below the portrait is the type of card ‘Sorcery’, and below that, the effect. Sorceries do not have Power or Toughness, and are non-Permanent cards. Once their effect has been used, they leave the field and go to the Graveyard. As they have one-time only effects, Sorcery abilities tend to be more powerful than those of Permanents with the same Mana cost. This is an example Instant. It has a Red Mana cost and is non-Permanent. Instants differ from other Sorcery cards in the fact that they can be used from your hand almost at any time, including the opponent’s turn, provided you have the mana to pay for them. As such, Instants are some of the most powerful tools for counter-play in the game of Magic, allowing you to instantly respond to opponent’s threats. Many players will choose to use Instants only during their opponent’s turn, as it grants them more flexibility with the threat they choose to remove. When an Instant has been used, it is sent to the Graveyard. 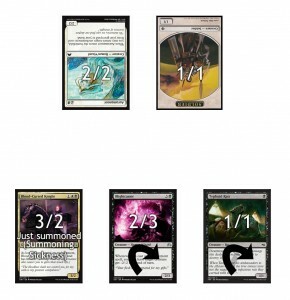 The field for Magic: The Gathering is very simple compared to other card games. There are literally three zones – the Deck, the Graveyard, and the Battlefield. The Graveyard is where all cards that have been destroyed or used go, while the Battlefield is where all Permanents stay, whether creatures or lands. By convention, Lands are played closest to the player who controls them, and Creatures in the middle of the two players, but this is largely optional. Players may control as many Permanents as they wish. Setting up in Magic has a number of steps. Firstly, both players set their life total to 20, shuffle their decks, then draw a hand of seven cards. If a player draws a hand they’re not happy with, they have the option to Mulligan, returning their whole hand to the deck, shuffling and drawing the number of cards returned minus one. Therefore, the first time you Mulligan will mean you draw six cards, then the second will mean you draw five, and you can keep going until you have a hand you like. When both players have done this, the first player begins their turn. The first player, however, does not draw a card during their first draw step. There are three steps to the beginning of a turn. First, you untap all your Permanents. Second, you enter the Upkeep step. This is the part of the turn where abilities which activate at the start of your turn trigger, and various costs have to be paid. Abilities can also be activated at this time, including casting Instants. Thirdly, you enter the Draw phase, where you draw a card from your deck. The main phase is where you can play the majority of cards. Players may play one land per turn during their own main phase and also play any number of other cards, provided they can pay the Mana cost. This phase is (usually) the only phase in which Creatures, Artifacts, Sorceries, Enchantments and Planeswalkers can be played. The player has one of these on either side of their Combat phase. In the Combat phase, you can declare attacks with any number of your creatures, but all attacks must be declared at the same time. Combat will be covered in more detail below! Instants and abilities can also be activated at this time. This has two steps. The first is the End step, where all ‘at end of turn’ abilities activate. Instants and effects can be activated at this time. The second is the Cleanup step, where the turn player must discard cards until they only have seven in their hand, and all damage is removed from Creatures. Unless an ability triggers in this step, no-one can choose to use instants or effects! In this example, the player controls three creatures. Blood-Cursed Knight (3/2) was played this turn, and cannot attack because it has ‘summoning sickness’, preventing it from attacking. The player, however, decides to declare attacks with the other two creatures and so taps them both. At this point, either player can decide to cast Instants or use abilities. Now, the defending player may declare blockers. This means that they can use creatures on their side of the field to intercept the opponent’s attacks, and defend themselves! Only untapped creatures can be used to block, but as both the defending player’s creatures are untapped, this causes no issue. Multiple blockers can be assigned to the same target, and, if this is done, the attacker may choose which one will be damaged first, then second, and so on. In this example, the defender chooses to use both their creatures to block Blightcaster (2/3). Once blockers have been assigned, either player can decide to cast Instants or use abilities. If a blocker is destroyed at this time, then the defender does not get to re-assign their units! Once blockers have been assigned and any effects have been used, all creatures deliver their damage simultaneously. In this example, Typhoid Rats (1/1) was unblocked, and so deals damage equal to the defending player equal to its Power (1). Blightcaster (2/3), however, was blocked by two creatures, which is where things get more interesting, and why the priority of defenders matters. The attacking creature can deal its full Power (2) as damage, split between the defenders. However, it has to deal enough damage to the first defender to destroy it before it can apply damage to the second. This means that the attacking player can (potentially) kill all of the defending units, as long as their Power is high enough. In this case, the attacker prioritises the damage to the Soldier token, inflicting one damage, then the rest is dealt to the Auramancer. The defenders also deal damage to the attacking creature at the same time, which in this case is enough to kill it. Therefore, the Solider token and Blightcaster are both destroyed at the same time. During the Cleanup step of the turn, all damage inflicted on Creatures is removed, leaving them perfectly healthy. Therefore, if you didn’t quite finish off a monster during one Combat Phase, you may need to use an Instant or ability to finish the job. In this example, the Auramancer would be fully healed to 2/2. In this instalment, we have learned how to generate and use Mana, the different kinds of cards, how to set up, how a turn is structured and how to attack and block. Next time, we will look at abilities in more detail, including Enchantments and Planeswalkers.